d. 26 May 1555 Thomas was a Protestant, and when he was discovered by the informer, Bishop Bonner, he was seized and imprisoned. As a result of his refusal to recant his Protestantism, Thomas was one of three hundred who were burned at the stake in Essex, England on May 26, 1555 during the reign of Queen Mary I ("Bloody Mary"). It is believed that the story of Thomas Highbed in Fox's Book of Martyrs, refers to him. Before being burned alive, Thomas last words were believed to have been "Forgive them Lord, they don't know what they do. Lord Jesus, receive my spirit!" Henry was a judge and politician. Sir Henry became governor of Lincoln's Inn in 1591. Between 1588 and 1589, he was Member of Parliament (MP) for St Ives , for Yarmouth 28UK_Parliament in 1597 and 1601, and for Norwich Parliament from 1604 to 1611. Henry served as Attorney for the Court of Wards in 1605 and Attorney General for England and Wales between 1606 and 1613. From 1613 to 1625, his abilities were further recognized and he was elevated to Chief Justice of the Court of Common Pleas. Having been Lord Chancellor to Henry Frederick, Prince of Wales , he was also Chancellor and Lord Keeper of the Great Seal to Charles, Prince of Wales ,Charles_I_of_England. 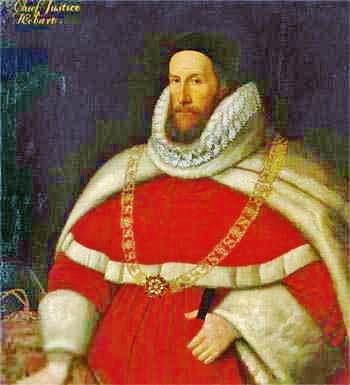 He was conferred the honor of Knighthood in 1603, and was made Baronet, of Intwood in the County of Norfolk on 11 May. Sir Henry Hobart, was respected for his knowledge and sophistication in matters of estate management. He successfully acquired a fair amount of Norfolk property, including the estates of Intwood in 1596 and Blickling in 1616, where he was buried on 4 January. He lays at rest there with his wife, Dorothy.